A green group and legislator warned the worsening air quality at tourist spots would scare off visitors, and are urging government to tighten the air-quality measuring standards. Greenpeace have conducted on-site monitoring of the levels of respiratory suspended particulates (PM-10) and fine suspended particulates (PM-2.5) on Monday and Tuesday this week – prior to the peak tourist period of “Golden Week” – in a pedestrian area of Mong Kok. The experiment discovered that the concentration levels of both particulates had three times exceeded the World Health Organisation’s most stringent standards. It means tourists and local residents’ health could be threatened if they are exposed to the area for several hours. Paul Tse Wai-chun, a legislator in the tourism sector, said the poor air quality would damage the city’s image in the long run. An earlier survey found 48.8 per cent of local tourist guides had received complaints from tourists about the city’s air pollution, Greenpeace said. Meanwhile, Mr Tse called on the government to amend the air-quality measuring standards in accord of the WHO guidelines which [were] established in 2006. The current government standards had been adopted since 1987, and it did not include PM-2.5 – which research suggests can penetrate deep into human lungs and have more severe health effects than larger particulates. “The current standards are too loose and outdated,” said Mr Tse. He said it is the responsibility of the government to update the Environmental Protection Department’s Air Pollution Index to let the public know the real situation of air pollution. Mr Tse added that initiatives to improve the “wall effect” created by high-rise buildings and the control of traffic flow in busy districts should be undertaken. Despite the government would commission a study to review the air-quality objectives and development a long-term management strategy, Greenpeace campaigner Prentice Koo Wai-muk said the government has no time-table to amend current standards to meet the WHO’s more stringent standards progressively. And the green group would update a “Real Air Pollution Index” on the website – www.airtruth.org – which would monitor air pollutants including sulphur dioxide, ozone, respirable suspended particles and nitrogen dioxide with the updated WHO standards. Meanwhile, Greenpeace has made travel tips on the city’s scenic spots with better air quality to tourists. Mr Tse said the government can promote those spots as a remedy. Greens have urged the government to step up the tightening of air-quality measuring standards – along international guidelines – after records in the past two months show air quality remains unsatisfactory. The administration said it had been carrying out a review and would finalise the new measuring standards next year. Three Greenpeace members yesterday climbed to the top of an air-monitoring station in Central and unveiled banners urging the government to revise its standards to reflect those introduced by the World Health Organisation in 2006. The group found that in the past two months there had been 44 days when at least one monitoring station had recorded 24-hour-average concentrations of particulate matter that exceeded the WHO standards. On one day in August, concentrations surpassed WHO standards in all but one of the 14 monitoring stations. In Causeway Bay, the measurement was 1.86 times the standard, but the official index classified the area as only having a “medium to high” level of pollution. “The government standard, established in 1987, is too loose and outdated, failing to reflect the truth and protect our health,” Greenpeace campaigner Prentice Koo Wai-muk said. Mr Koo urged the government to monitor minute particulates, known as PM-2.5, which research suggests can penetrate deep into human lungs and have more severe health effects than larger particulates. In June last year, the Environmental Protection Department commissioned a study to review the air- quality objectives and develop a long-term management strategy. A spokesman said the study was expected to be completed by the end of this year, after which the department would launch a public consultation and finalise the standards. The study would make reference to the WHO guidelines. The existing index is calculated with reference to seven pollutants, including sulfur dioxide, nitrogen dioxide, respirable suspended particulates, carbon monoxide and ozone. The WHO has recommended interim targets for governments to meet the more stringent standards progressively. Green groups and medical academics in Hong Kong say it is time for the government to adopt World Health Organisation air-quality guidelines, with Greenpeace releasing a downloadable “Real Air Pollution Index” software “widget” based on the international recommendations. The widget, for computer desktops, can be downloaded free from the environmental group’s website and provides instant updates of air-pollution levels according to the WHO standard. Edward Chan Yue-fai, campaign manager of Greenpeace China, said it was important for the public not to be misled by the Environmental Protection Department’s Air Pollution Index (API). University of Science and Technology atmospheric scientist Alexis Lau Kai-hon also called for a change. “API is a tool to communicate with the public. If it fails to communicate with the public about the health risk, then it is time to consider a new standard,” Dr Lau said. The API ranges from 0 to 500 and is divided into five bands according to the potential effects on health. It is calculated by comparing the measured concentrations of major air pollutants with health-related air-quality objectives established under the Air Pollution Control Ordinance. However, the API is out of kilter with the standards applied by the WHO’s guidelines. There are times with low API readings when pollutant levels are much higher than the WHO’s recommended maximum intake. For example, the API in Mong Kok at 5pm on August 4 was 30, but some pollutant levels were much higher than the WHO standard. According to the Environmental Protection Department, no action needs to be taken when the API is 30, which is considered “medium” pollution. But the actual level of respirable suspended particulates – particulate matter measuring less than 10 microns – was 14 per cent higher and the level of sulfur dioxide 33 per cent higher than in the WHO guidelines. Long-term exposure to air with high concentrations of particulate matter is associated with a higher risk of mortality, while high levels of sulfur dioxide have been linked to childhood respiratory disease. Most recreational runners in Hong Kong responding to questions on a popular running website recently said they would check smog levels before exercising but few said they looked at the API. However, one runner said he called off runs if the API rose above 100. Although no country strictly follows all the WHO guidelines, Anthony Hedley, professor of community medicine at the University of Hong Kong, said that was not an excuse for Hong Kong to avoid doing so. 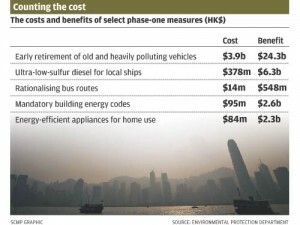 The government replied that a study scheduled to be completed by the end of this year would recommend a new set of air-quality objectives and a corresponding long-term air-quality-management strategy for Hong Kong. It said it would make reference to the WHO air-quality guidelines. Lawmakers yesterday endorsed cross-border emissions trading and gave legal backing to caps on power firms’ emissions of pollutants. They demanded unanimously that officials set out a framework for handling the city’s “carbon footprint”, which was excluded from the measure passed yesterday because officials say they need more time. The measure also spells out the way caps on emissions of three major air pollutants will be determined beyond 2010. Cross-border emissions trading will give power firms leeway to meet emissions caps by means other than reducing the pollution their chimneys spew into the air. A majority of lawmakers voted in favour of the Air Pollution Control (Amendment) Bill 2008. However, the legislators were unhappy that it has not put Hong Kong’s efforts on a par with other countries in the fight against climate change. “When is the government going to really take global warming seriously? Please stop telling us that the issues are being studied and instead give us a clear timetable and strategy,” said Audrey Eu Yuet-mee, the Civic Party leader. Democrat Sin Chung-kai urged the government to table concrete initiatives in the next legislative term to keep Hong Kong ahead of other Chinese cities in curbing greenhouse gas emissions. DAB legislator Choy So-yuk criticised the measures as inadequate and biased in favour of power producers. “It is just a little better than nothing,” she said. She proposed an amendment to limit the validity of emissions-trading contracts to five years. While arguing her case, she appeared close to tears as she claimed an official, who she did not name, had made misleading comments about her proposal. “There have been media reports quoting official sources saying the real motive of my proposal was for election purposes. This is complete nonsense and misleads the public,” she said. Without a time limit, Ms Choy said, emissions trading would merely create a window for local power producers to emit excess pollutants indefinitely as long as they could buy sufficient quota from mainland counterparts to cover the extra pollution. Fellow lawmakers rejected her proposal. They preferred a government proposal to limit power firms to buying quotas equal to a maximum of 15 per cent of their annual pollution caps. Environment minister Edward Yau Tang-wah said Ms Choy’s proposal would reduce power producers’ flexibility to trade quotas. As for the city’s carbon footprint – the measure of the carbon emissions all economic and human activity generates – Mr Yau said the administration was serious about taking action, but reducing it would require a significant adjustment to power producers’ fuel mix. The Legco meeting was interrupted when two Greenpeace protesters in the public gallery held up a banner labelling the environment minister an “accomplice to global warming”.